At the weekend I had the chance to visit the church of St Senara in Zennor, Cornwall. 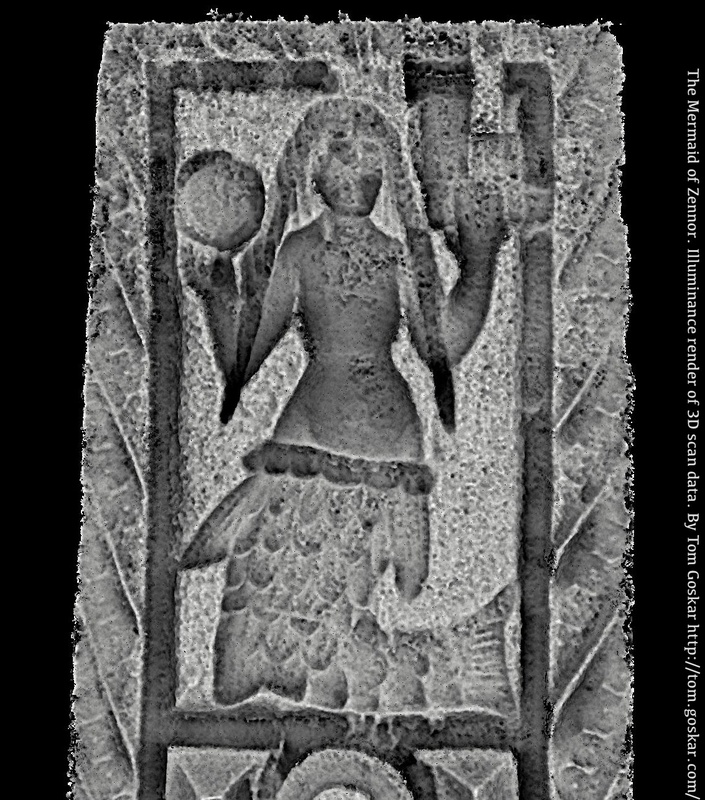 I spent some time looking at the wonderful medieval carving of the famous mermaid. Despite not having my Canon DSLR with me, I decided to take a series of photos with my iPhone 4S (8MP) with the view of trying to reconstruct a low-resolution 3D model using photogrammetry to see how well opportunistic captures might come out. After processing the data, I managed to extract reasonably detailed geometry, with just over a million vertices (points) after cleaning the data up (removing unwanted elements, removing stray points). A bit of processing and I was able to produce the above image to show some nice details on the carving. The mermaid looks quite different to my eye. Below is a render using a directional surface filter. The data is a very long way from being perfect, and I was unable to take any measurements to scale and check the accuracy of the geometry. However, the results are very usable for interpretative purposes, especially given the nature of how the underlying photos were captured – by hand on a 2.5 year old iPhone. 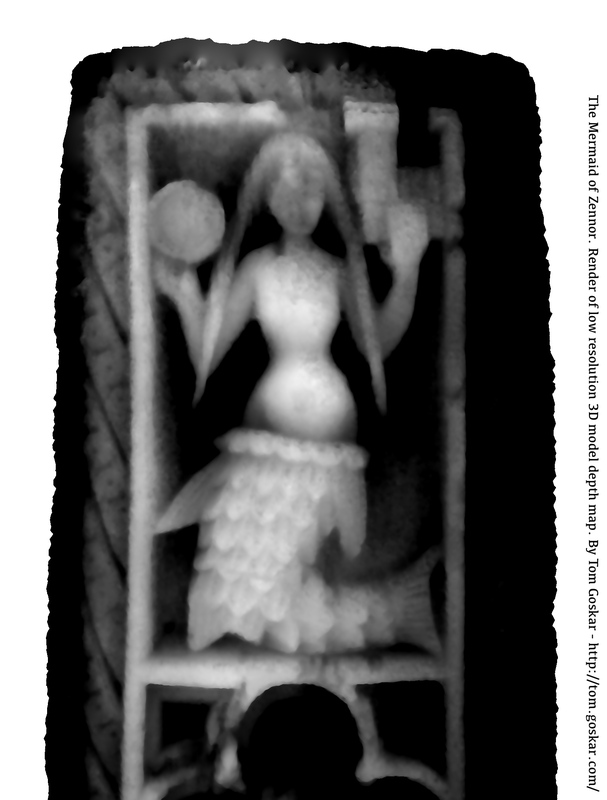 The following image is a ‘depth map’ of the Mermaid, where black is far and white is near. Can you see a hint of the Mermaid’s face? 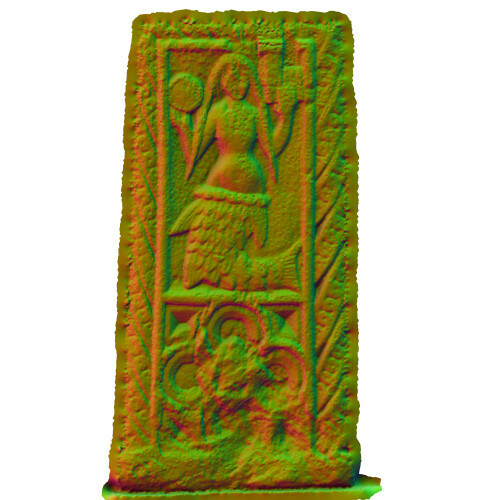 Scroll down to see an embedded 3D model (latest Firefox, Safari or Chrome browser recommended). Tom Goskar, Proudly powered by WordPress.